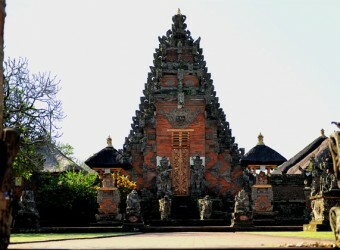 It was built in 944, and Batuan Temple has long history. There are many beautiful reliefs. You may donate money at the gate and write down your name on the note, after that, going through the divided gate as the Balinese style of gate. The gate represents the sacred mountain, and there is the single-leaf like wall in front. They has the meaning that preventing evil coming in. After I went to Batuan Temple I wanted a woodcarving. I asked the guide to take me to the souvenir shop!! I got Balinese woodcarving. But actually I wanted a bigger woodcarving….